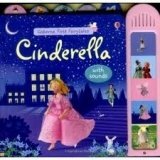 This is a chunky board book re-telling the beloved fairytale for young children with a sound board of sound effects to bring the story to life. Poor Cinderella is a slave to her wicked stepmother and ugly step-sisters, but when her Fairy Godmother arrives she is transformed into the belle of Prince Charming's ball! But will true love conquer all? It is illustrated with the colourful handmade models of Jo Litchfield, and with robust tabs to help children locate their favourite scenes. The brilliant sounds bring the story to the life including Cinders scrubbing the floor, the messenger at the door with an invite for ball and the fairy godmother turning the pumpkin into a carriage. It is perfect for reading aloud to young children, or for children who are just beginning to read to tackle alone.